There are 4 posts tagged Lessons Learned (this is page 1 of 1). There are people who stick to their primary pursuits for long and then there are those whose energy keeps changing direction. Between these two extremes, there are people who stick to their primary pursuit but still manage to go wherever their energy takes them. I have figured out that I belong to that middle path. My alternative pursuits like writing, blogging, photography, social media etc. are my source of creative energy that helps me become more effective at work. The goal of these learning experiments is simple: to experience deeply, learn immersively and share generously. The latest addition to these learning experiments is sketch noting. If you are reading this blog regularly, you would have noticed that every post has a sketch note – a visual representation of ideas in one page. Inspired by a post from Abhijit Bhaduri and work of Mike Rohde, I started sketch noting ideas two months back and sharing them here. Each week, I created two sketch notes on ideas that really resonated with me out of so many things that I read/saw daily. I enhanced my visual library by studying other sketch notes for illustrations and fonts. 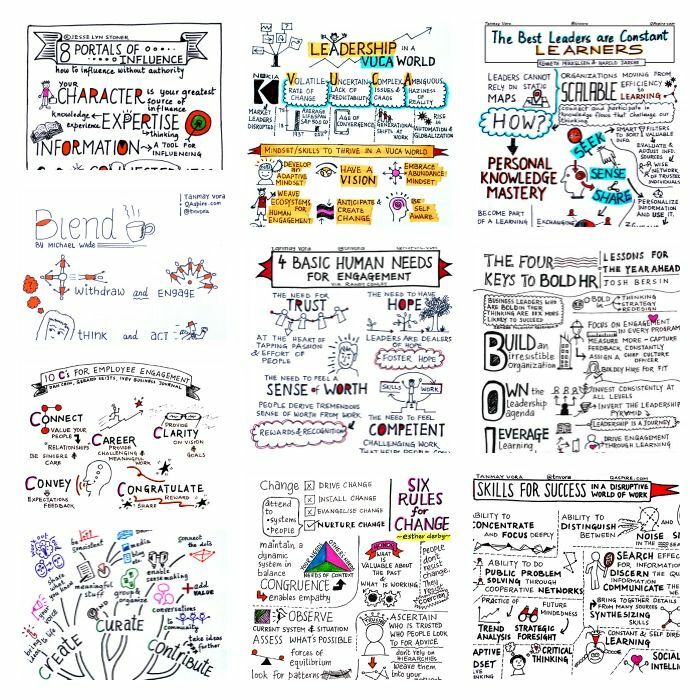 I created about 25+ sketch notes in two months and most of these were widely acknowledged via shares, likes, re-tweets and comments. Learning becomes even more purposeful when you know others are using your creations meaningfully. Folks at NHS, UK converted my sketch note on 6 Rules of Change into a poster. Some authors requested their ideas in form of sketch notes so they can use it for promotional purposes. People shared these sketch notes in their classes, meetings and even during conferences. Australian HR Institute’s HRMOnline featured my sketch note in their weekly round up video. And along the way, I found interesting new applications of this newfound skill. I created handmade “thank you” cards to appreciate people in my team. I experimented with creating sketch quotes – a sketch that adds a different dimension to a quote by someone else. I eventually used sketch note as a presentation for my talk recently. All of this in about 2 months as a side project! But then, all this started as a learning experiment. So what did I learn about learning while learning how to create sketch notes? Here we go. Everything you do (or have done) connects: I cleared a state level architecture entrance exam back in 1995 (right after my schooling) for which I worked on my sketching/drawing skills. I could not secure admission and I thought it was all a waste of my time. But when I started creating sketch notes, that practice came in handy. I just had to hone it. Here is my big take away: Not everything we do yields instant rewards and not all rewards are visible. And yet, everything we do (or have done) helps us somewhere in some unique way. Knowing this is the key to synthesize our skills and lessons to create or address a unique context. Intersections are powerful: Explicit learning deals with absolutes and absolutes are crowded with a lot of commoditized knowledge. Real learning (tacit) happens at the intersection of two or more things. That is where ideas overlap and innovation happens. People create sketch notes about everything – travel, to do lists, notes and so on. I decided to create sketch notes on business topics I care about. That way, I can bring in my own ideas, experiences and interpretations to the illustrations. This is where my ability to represent visually intersects with my interest in the topic and my unique experiences. Learn, Do, Share, Adapt: The first sketch note I created was quite naive (and unfinished) but I still gathered courage to share it on Twitter. Almost instantly, people responded affirmatively. This led to more creation, sharing, feedback and hence improvement. I gained confidence at each stage of this cycle. When we learn from open networks, it is our obligation to give it back in whatever form we can. The feedback, encouragement and support we receive from these networks is just a huge bonus. We need to “learn out loud.” Or as Harold Jarche puts it, co-create knowledge by adding value to existing knowledge through our unique perspectives. Going where your energy takes you is NOT a waste of time: We often think of “return on investment” when learning. But our best learning happens when we learn out of joy. Everything that I have learned so far (personally as well as professionally), I have learned because I was drawn towards it. All I had to do was go with the flow rather than resisting it. And the great thing is – when you learn out of joy, you will never feel like you did a lot of “hard work” to learn. Learning then becomes a way of life. Visual is powerful: Writing about things is a great way to learn but words alone are not sufficient to make the connection between ideas visible. And it is not about drawing skills at all. It is about making the connections between ideas visible, even if it is on your whiteboard. For me, representing ideas in sketch note form allows them to penetrate deeper into my sub-conscious. Research says that doodling improves learning and I’ve experienced it first hand! Excitement is contagious: Learning things builds your mental muscles and generate a different positive energy within you which is contagious. One day, my 9 years old daughter walked up to me with a request to teach her how to create a sketch note. She saw me doodling and instantly wanted to do it. A few people in my teams attempted to represent their project related ideas in form of basic sketch notes. I instantly knew that if I am inspired by learning journeys of others, my own journey may be inspiring others. It is both a privilege and a responsibility. We learn by seeing (visual), hearing (auditory), reading/writing and doing (kinesthetic). What is fascinating about sketch noting is that it brings all these modes of learning in the game as soon as you start scribbling your ideas onto that blank piece of paper. I am so looking forward to lessons this journey unfolds from here. The sketchnote podcast by Mike Rohde is a great way to learn the fundamentals. You complete a project and then do a small ‘post-mortem / retrospective analysis’ of what went well and what did not. You then document these lessons in a nice looking template and share it with all stakeholders before getting onto the next project. Next project looks exciting in the beginning and then, same set of challenges are encountered. “Lessons-Learned” often end up being “Lessons-Documented-In-Last-Project-That-Are-Going-To-Show-Up-Again”. All improvement depends on lessons you document and what you, as a leader, do about it. If you are a business leader, project leader or an improvement expert, here are five practical things you can do to ensure that lessons are really learned. Assign Responsibility: If you have a quality group, great! If you don’t, you can assign the role of improvement expert to any senior member in your team. Mandate should be to improve the process and implement the improvements. Project Managers are best candidates since they deal with these challenges day in and day out. Focus on “actions”: Once documented, identify a set of immediate actions to be taken to ensure that these lessons go into practice. Compile a central action log that contains lessons from all the projects / retrospectives. Assign responsibility for each action and have a deadline. Track the progress from time to time. Maintain a central log of lessons learned: Unless lessons are visible, they don’t go into practice. One idea is to maintain a central log of all lessons learned, actions and resulting improvements. This is also a great way to track improvements. Revisit them: It is easy to get back to your project challenges and forget the lessons learned. Revisit them from time to time. Have monthly update meetings, publish these on your intranet, create easy to view lists of Do’s and Don’ts – whatever! But make sure that lessons learned are visible to people. “Lessons Learned” as inputs to Process Improvement: Convert each lesson into a process. Get the buy-in from teams and then train everyone. This is also a great way to ensure that your quality system evolves with challenges you face in your context. Lessons are only ‘learned’ when they find their way into the future projects as positive experiences. Challenges help us grow – only when we face new challenges each time and learn how to tackle the ‘old monsters’. Unless we do that, repeating challenges will only wear you and your team out! Lessons then, are not learned, but just documented. Not fun – I am sure you’ll agree!